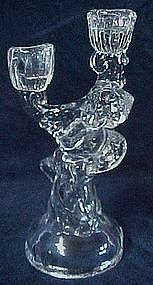 Clear heavy glass candle holder is full of bubbles and looks a little crudely made. Still very pretty, and holds 2 candles. Measures 7 3/4" tall and has no chips or damages. Stem is an angel. No makers mark that I can see.